yay for picnic season! that gold flatware is beautiful — definitely glams up the outdoor dining ambiance! yes! Those are actually handmade by my friend Sarah, aren’t they the most amazing?! I so want to go on a picnic now! Dream picnic material, indeed! And, I’m with you on the produce thing even though root veggies are the best. You just know that onslaught of heirloom tomatoes is coming in a month or so! Thanks for the lovely post. Lovely picks! 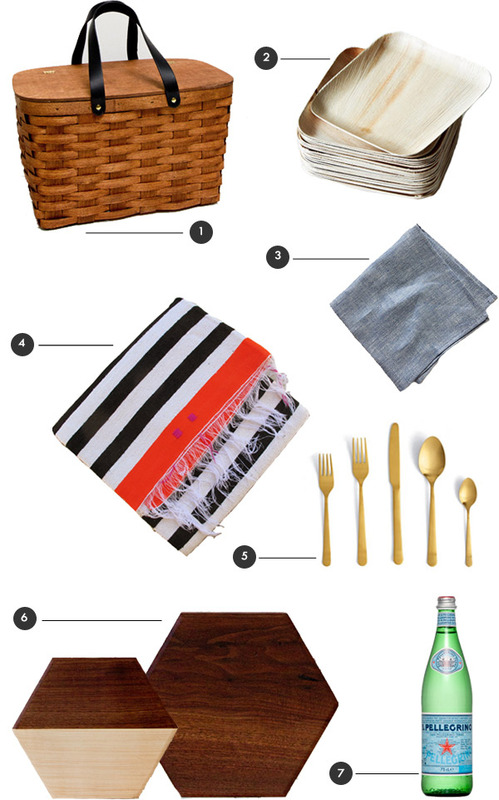 A traditional picnic basket is a must! Romantic and charming. I love the striped blanket…perfect for an afternoon in the park or a day at the beach! Thanks Kate! I agree, this striped blanket is going to get A LOT of outdoor use! Expect 75 Instagrams of my feet, the blanket and the beach in the background…. HA! Helko would you mind letting me know which webhost you’re utilizing?